Remy (Patton Oswalt) is a rat with a very sophisticated palate. His dream in life is to create new flavors and he wants to be like his hero, the late great Chef Gusteau (Brad Garrett). Remy winds up at Gusteau's restaurant, now run by Gusteau's former sous chef, the now head chef Skinner (Ian Holm). They have just hired on a new garbage boy named Linguini (Lou Romano), who one day starts messing with the soup, making it taste terrible in the processes. Remy catches him and sneaks over to fix the soup. When the customers love it, Linguini gets the credit, but he saw Remy fix it and can't exactly tell the world a rat cooked the soup. Linguini and Remy team up as Remy uses Linguni as his puppet to fulfill his dream. Meanwhile, head chef Skinner is set to inherit the restaurant unless a heir appears. When it turns out Linguini may be Chef Gusteau's son, Skinner looks to hide this secret. In normal Pixar tradition, this film was well received by critics, but in an audience deviation, is one of the lower performing Pixar films at the domestic box office. It's not like it did terribly, though, it was just much more well received by an international audience. We aren't sure why this is the case because this film is adorable. It may have to do with the overall theme of French cooking, which can give the movie a bit of a posh, snooty feel. Sure, this is a more mature theme and something that is probably hard for kids and even some adults to relate to. Most children would rather eat a hot dog than a plate of ratatouille or most French cuisine for that matter (and, again, some adults, too), but French cooking and a Parisian landscape are just the vessels for the underlying message of the movie. In true Pixar tradition, this message is uplifting and one that will connect with people of all ages on many different levels and one which we love and are touched by personally. Patton Oswalt voices the main character Remy, a rat with a heightened sense of smell and taste. This makes him a picky eater and a bit of a food snob, something a rat can't really afford to be. Oswalt is one of our favorite comedians and we think he does a tremendous job voicing this character. He breathes a whole lot of (adult) life into such a small little animal. Lou Romano voices Linguini, the main human character of the movie, who is a lousy cook and is sort of bumbling fool most of the time. Once accosted by Remy after he displays horrible kitchen skills, Linguini reluctantly agrees to partner up with the tiny rat so he can fulfill his big dream of being a chef like his idol. Remy winds up controlling him like a marionette by tugging his hair in a chaotic and fun system of getting things done. The scenes where Remy learns to control Linguini as Linguini flops about like a wet noodle may be the most fun for younger audiences as it's the most silly part of the film. These scenes are only second to any time the rest of Remy's rat family is around getting into trouble. While kids will love the goofiness of the film, adults will identify with its overall message, as well as its enjoyable comedy, its impressive writing and directing by Brad Bird, its distinct voice-overs, its crisp, gorgeous animation and its exciting twists, turns and sentiment. 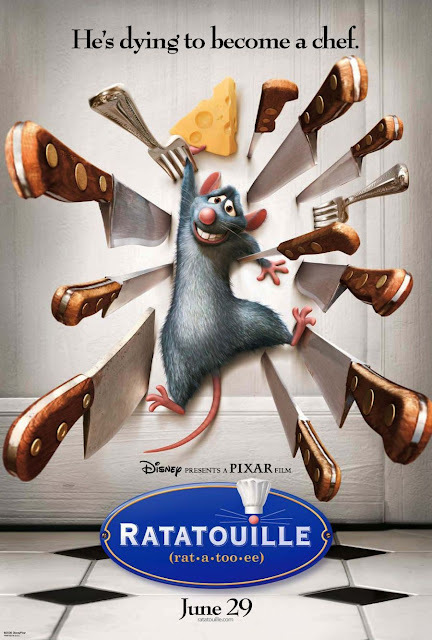 You will be remiss if you miss "Ratatouille" since it is one of the most charming, delightful Pixar movies to date. We don't get the hate some audience members have for this film because all we see is a well executed, hilarious affair of the heart, featuring food good enough to make you want to jump through the screen to taste it.